St, John's Episcopal Church. —. St. John's Episcopal Church was designed on an Elizabethan model by the noted architect, Cass Gilbert, among whose other significant buildings is the present Minnesota State Capitol. Construction of St. John's began on August 1, 1898.On February 12, 1899 the church was consecrated and the first confirmation held. Episcopal church services in Moorhead date from 1872 when the Reverend James A. Gilfillan conducted a service in a Northern Pacific Railroad passenger coach. With the arrival of Benjamin F. Mackall, a licensed lay reader, regular services began on May 13, 1873.. When the parish was organized in 1875, Mackall was elected Senior Warden, an office he held for 62 years. The movement to construct the present church was led by Mackall and W.H. Davy, who donated the land on which St. John;s stands. 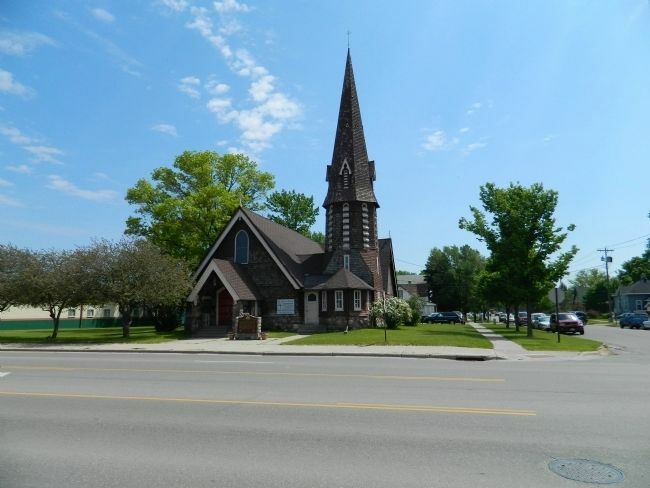 St. John's Episcopal Church was designed on an Elizabethan model by the noted architect, Cass Gilbert, among whose other significant buildings is the present Minnesota State Capitol. Construction of St. John's began on August 1, 1898.On February 12, 1899 the church was consecrated and the first confirmation held. 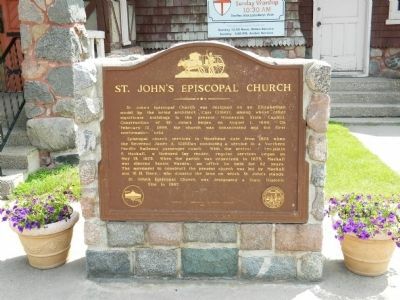 St. John's Episcopal Church was designated a State Historic Site in 1967. Erected 1967 by Minnesota Historical Society. Marker series. This marker is included in the Minnesota Historical Society marker series. N, 96° 46.057′ W. Marker is in Moorhead, Minnesota, in Clay County. Marker is at the intersection of 8th Street South and S. Second Avenue, on the right when traveling north on 8th Street South. Touch for map. Marker is in this post office area: Moorhead MN 56560, United States of America. Touch for directions. Other nearby markers. At least 8 other markers are within 11 miles of this marker, measured as the crow flies. Douglas House (approx. 0.3 miles away); Veterans Memorial Bridge (approx. 0.4 miles away); Red River Transportation / A Busy Port (approx. 0.4 miles away); 'The Next Great City' (approx. half a mile away in North Dakota); Gasoline Horsepower (approx. half a mile away in North Dakota); "The Woodchipper" in FARGO (approx. 4.7 miles away in North Dakota); The Fargo Walk of Fame (approx. 4.7 miles away in North Dakota); The First Prestressed Concrete Bridge Deck Constructed in North Dakota (approx. 11.1 miles away in North Dakota). Touch for a list and map of all markers in Moorhead. More. Search the internet for St, John's Episcopal Church. Credits. This page was last revised on June 16, 2016. This page originally submitted on June 27, 2011, by Bill Pfingsten of Bel Air, Maryland. This page has been viewed 598 times since then and 5 times this year. Photos: 1, 2. submitted on June 27, 2011, by Bill Pfingsten of Bel Air, Maryland.